The Canon MX922 didn't last long. We bought a bunch of ink, but quickly, it refused to print no matter how new the ink cartridge was. Printers and printing is little more than a scam, but I was forced to purchase another printer. This time, I went cheap since the MX922 costs circa $170. The problem with the cheap printers is that they've got little-to-no user interface. It's about as hard to configure them as it is to program an old VCR. From any state it's in, power down the printer. Press the set-up button—it's the one with tool icons on it. Use the arrow keys to reach Device settings. Use the arrow keys to reach LAN settings. Use the arrow keys to reach Wireless LAN setup. It will begin to look for wireless-access points; it may mumble something about pressing the WPS button—just ignore this. Press the Stop button—it's got a red triangle on it. The image to the right here shows a finger pressing this button (also hiding it in the picture). Use the arrow keys to reach Standard setup, wait a bit. Use the arrow keys to reach the desire wireless-access point by name. If the one you want isn't found (I have several, but you'll also see your neighbors' points too), consider that you don't have the printer in an optimal location. Move it and try again. Once you see displayed the name of the wireless-access point you desire, press OK. Enter the passphrase (see below*). Press OK to get set-up to try the passphrase against your wireless-access point or router. If successful, it will say Connected. You press OK.
You have only the following keys to aid you in this. All of these keys are shown in the image to the right here. The keys with numbers and letters in the format of an old-style telephone. The * key. This key acts to change the mode of the alphanumeric buttons. Awkwardly, it will change between upper and lower case. The arrow keys. These are very useful enabling you to edit your passphrase, especially in combination with the Return (or Delete button). The Return or Delete key; this is the upper-leftmost button in the image here. This button is used to delete a letter, number or special character you've typed and, in most cases, will collapse it out from between the two surrounding it. I downloaded and exploded the driver packages (for printer and scanner) and, for the most part, took the defaults. (Julene was able to find the printer from her Apple Macintosh Air and print without doing anything!) I also noted the IP address the Linux installation script found my printer on. 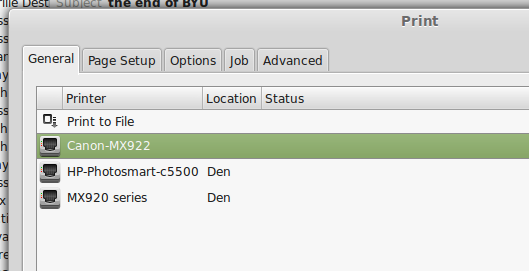 My router lists is, but, as for many other nodes, as "Unknown." drwxrwxr-x 2 russ russ   4096 Feb  9 10:29 .
drwxr-xr-x 6 russ russ   4096 Feb  9 10:28 ..
drwxrwxr-x 6 russ russ   4096 Feb  9 10:30 .
drwxrwxr-x 4 russ russ  4096 Dec 11  2014 .
drwxrwxr-x 6 russ russ  4096 Feb  9 10:30 .. Selecting previously unselected package cnijfilter2. [email protected] ~/Downloads/canon/cnijfilter2-5.10-1-deb $ cd .. Selecting previously unselected package scangearmp2. I didn't buy this printer for its scanner being happy with my now old Hewlett-Packard printer (which no longer works as a printer). That printer offers a web page (http://192.168.0.103) which I just go to use it. However, as I happened to have the driver I went ahead with it. My last Canon never worked as near as I could tell. Unlike the experience posted above, I ran scangearmp2 and it just worked after ai asked it to scan for scanners. This appears to be Canon scanning software. The scanner just worked on a little picture I threw in to try out. So, okay, who can complain, eh? In summer, 2015, exasperated with my HP printer's inability to keep working, I bought a Canon printer. However, not really needing a printer much, I didn't install it until the HP stopped working (for printing) absolutely. It worked fine for scanning. The Canon printer has a stupid, bare bones, information-only web page. 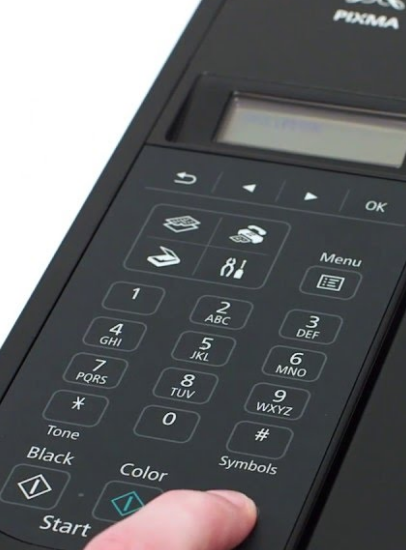 It won't tell you if you're out of ink, it has no interface to the scanner, etc. This is disappointing. Other setup option (wait for it to time out). Search for WPS-compatible access point again? Select wireless access point/router by name. WPA (AES)—the first highlighted one. I've seen complaints that drivers for the scanner are hard to find and/or don't work. I'm not too worried about that since my old HP 5550 works just fine as a scanner. drwxr-xr-x  3 russ russ    4096 Mar 21 20:23 .
drwxr-xr-x 10 russ russ    4096 Mar 21 20:23 ..
drwxr-xr-x 4 russ russ  4096 Dec 19  2012 .
drwxr-xr-x 3 russ russ  4096 Mar 21 20:23 .. Selecting previously unselected package cnijfilter-common. Selecting previously unselected package cnijfilter-mx920series. Once I finished this, I opened an e-mail, selected to print it, then saw this printer twice because a) I just added it under the name "Canon-MX922" and b) it's been sitting there advertising itself on the networks since yesterday under the other name. drwxr-xr-x  4 russ russ    4096 Mar 21 20:44 .
drwxrwxr-x 4  500  500  4096 Dec 20  2012 .
drwxr-xr-x 4 russ russ  4096 Mar 21 20:44 .. Selecting previously unselected package scangearmp-common. Selecting previously unselected package scangearmp-mx920series. However, that still requires an application to use. It said it couldn't find any scanners, I dismissed the modal, then it asked me to Update Scanner List. I did this and it found my scanner. I clicked OK. Up popped some big, if primitive, scanning application named ScanGear. I'm not going to play with it now, but it looks like it will work.